In this sketchup video tutorial, Justin Geis, the renowned sketchup tutor, has demonstrated the functionalities of outliner tool inside sketchup. This tool will save huge time while working in sketchup as well as retain your model organized. Outliner comes as a little menu to the right hand side of sketchup. If is not visible to the right hand side, just go to window then click on default tray and check the box beside outliner (check the box). Also make sure that tray is turned on. If there is a group or component in your model and the model contains group geometry, they will appear inside the outliner. To start with, draw a box, push pull it up, choose it, right click on the box and made it a group, as soon as it turns to a group, it shows up inside the outliner. Now it is possible to make changes to it, rectify it and make the model organized. After transforming the parts of your model into groups or components, the outliner monitors them properly. It is possible to establish the relationships among parts of your model in a structured outline style having one group nested inside of another. With outliner, the parts of your model can be hidden and safeguard them from unintended changes. To gather more knowledge on outliner, go through the following exclusive video tutorial. Click-Kitchen 2 and Click-Change 2 are considered as useful plugins for SketchUp. These plugin will allow you to draw and customize your 3D kitchen with the use of smallest detail. Click-Kitchen 2 comprises of over 5000 references of IKEA furniture with customize option. With this plugin, it will be possible to draw a standard IKEA kitchen with millions of scopes or a custom-built kitchen with your dimensions and materials. The plugin is compatible with SketchUp 2014, SketchUp 2015, SketchUp 2016, SketchUp 2017, SketchUp 2018. The plugin is available in sketchup extension warehouse. To watch live demonstration of the plugin, go through the following video tutorial. Profile Builder is a powerful extension for sketchup that is bundled with a flexible series of parametric modeling tools for SketchUp to accelerate the modelling speed significantly. The plugin makes the models smarter and adjustable to design changes. The new version of profile builder i.e. version 3 is just released. It is compatible with sketchup 2016 and higher versions. Span Assembly parts for generating great assemblies. With hole tool, parametric holes and openings can be created. Auto-assemble feature generates quick assemblies with a single mouse click. The users of version 2 can avail a discount coupon for upgrading to version 3. Go through the following video for the live demonstration of the plugin. This is an exclusive Sketchup article written by the Sketchup enthusiastic Aaron Dietzen. The article throws light on some useful features of section planes in Sketchup Pro. The section plane tool in sketchup is generally applied to view inside a model or generate a section drawing. Given below, some unknown facts about section planes. 1: Provide name to your section planes – While going to generate a section plane in SketchUp Pro 2018, it is required to provide both a Name and Symbol for each section plane you produce. The name recognizes your section plane in the outliner whereas the symbol demonstrates the actual section plane in SketchUp. 2: Discover your section planes in Outliner – In SketchUp Pro 2018, the section planes are recorded in the Outliner. So, it is possible to activate section cuts, converse the cut direction, align the camera view to a section plane to execute section plane interactions from the safety and comfort of the outliner window. 3: Control numerous section planes in several ways – In the View menu, toggle section plane visibility, section cuts, and cut fills for the whole model. To do it more correctly, just right click on any section plane and select to activate that one cut or conceal that one plane. If it is required to activate a cut when all section planes are unrevealed, just apply outliner to toggle the properties of separate section planes even though they are concealed. This individual interaction with a concealed section plan is also very beneficial for arranging the orthographic views. Just right click a concealed section plane in Outliner, and click Align View to generate superior drawings. 4: Make and edit section fills – To verify how a section cut appears in SketchUp and LayOut is a function of your style or the existing style in sketchup. So, open the Modeling Setting in the Styles window: Style Window>Edit>Modeling Settings (comes with the little blue box). There will be options for the section fill color, line color, and line width. It facilitates the users to turn the fill on or off and select what the fill is truly going to appear. Because section fills are connected with Styles, it is possible to save them as well as employ them on various models, or toggle among various looks as you proceed on. 5: Demonstrate several section cuts at once – It is often found that the section planes can add more than one and then activate them independently. But the unknown fact is that one will be able to actually demonstrate numerous cuts promptly by grouping section planes with geometry. As section planes will cut whatever geometry is being illustrated, it is possible to cut a model with a single plane, group the model with the section plane, then arrange another section plane outside the group to obtain multiple cuts in a single model. Slice and dice, now one gets the ability to cut up the model according to his/her choice. Here are the tips on how to change the background in SketchUp (not for render). Usually when we want to present our SketchUp drawing to our client, it’s only a sky, isn’t it? 3. Click “(+)” icon then select a bitmap whatever you want to show for your background image, usually its a sky image or something else. The bigger the image size will make more smooth. 4. then, you will get a dialog question window, choose “Background”. Then, “Watermark1” on the option can changed/renamed to whatever u want. 5. The next dialog, let the settings to the default, just click “Next”. 6. Next dialog, choose “Positioned in the screen”, then move the slider in the “Scale” to the right, This means our bitmap will strecthed fully. Thats why i suggest you use bigger image size so you will get smoother result. It is essential to utilize a standard rendering software to the make the quality of the models produced through SketchUp. There exist different types of rendering software plugins which are included with sketch up. This article throws light on six of the best software to render SketchUp on the basis of functionality, features and price. 1) Allura GPU for SketchUp: It belongs to a GPU based rendering plugin for SketchUp that employs the power of your system GPU to speed ups the renderings. It applies the video GPU to generate stunning rendering image with high speed and outstanding overall rendering experience. It applies calculating light paths with simple automatic settings. Some of its exciting features range from indirect illumination, colour bleeding, reflections, refractions, soft shadows, blurry reflections, reflective and refractive caustics and volume scattering. The users only have to edit the materials and click render for getting stunning results. 2) Ariel Vision: This software facilitates realistic rendering of objects and models within SketchUp. It makes beautiful rendered images devoid of applying complex settings. Ariel Vision contains various unique features which range from one-click rendering with superior results from pre-defined settings, persistent integration with SketchUp full Reflection and transparency controls for obtaining naturalistic materials. It also allows direct and indirect lighting with natural and artificial lights. Besides, it also contains nice HDRi skies and backgrounds to enhance the appearance of your model. 3) IRender nXt: IRender nXt is a robust plugin that produces photorealistic renderings directly inside Trimble SketchUp. It is very useful for landscape and set designers. The plugin easily transforms designs and models into superior images. This is a suitable tool for architects to illustrate their building plans. This software is ideal to render SketchUp files. It offers some useful features like rendering at any resolution and quality as well as fine tuned lighting, clearness in lighting capabilities. 4) Raylectron: It can produce simple rendering with elegant photos. The users will be able to edit how the model will appear with different lightning settings, from sun, sky and other settings. The X-ray vision feature facilitates to view interior render devoid of eliminating the exterior. Some of the exclusive features range from capability to stop the render, save it, reopen it later and continue the render. The users will be able to rotate, pan, zoom, and adjust the materials and lights right from the Raylectron viewer. Raylectron is also compatible with HDR maps and can save the rendered image as an HDR. Shaderlight: This software provides a more realistic rendering for SketchUp with various options through different modes and tools to simplify and retain your work models. Shaderlight offers a exceptional blend with uses giving option to select among progressive rendering and single shot rendering. The plugin also employs advanced lightning features to add a clean and quality look to your model. The users will be able to utilize the default resolution settings or edit this setting to arrange the proper blend of Sharon and concise images. Thea Renderer: With its innovative photo realistic engine, it can render sketchup files easily. 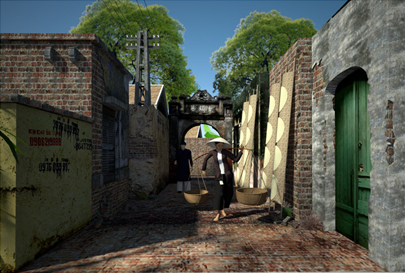 It comprises of exclusive independent studio and library of editors for materials texture and colour for unique rendering. The software employs unique engine technique known as biased and unbiased render modes to bring superior results. Some exclusive features range from application of Instancing of External Models (as Proxies), integrated & external Thea material editor, darkroom with multiple controls, advanced camera settings, and render channels. It facilitates to generate your models containing more detailed three dimensional results.